Car Locator - Dude, Where's My Car? You probably know the feeling of being out and about in a city you don’t know your way around in. All proud of yourself for having found a parking space, you rush off to your next appointment. You’ve managed to wrap everything up. And then, on your way back, the only thing going through your mind is “dude, where’s my car?”. I doubt that the guy standing in front of you can help you out. The only thing that can save the day is Car Locator, an app which simplifies your search for where you've parked your vehicle. Car Locator remembers where you parked your car and helps you find your way back to it after you’ve finished the day’s business. In order to do so, Car Locator uses different types of navigation systems. You can let yourself be guided by Google Maps. Or, you can let Radar View bring you to your destination. You can choose which means you prefer, depending on what your specific needs are. If you’re in a city, it makes sense to use a navigation system that relies on being guided by a map. But if you’re in a forest or whatnot, a radar system is probably the way to go, as paths that lead through woods often don’t show up on Google Maps. Using “Split View” you can also see both options on your screen at once. Your standpoint position is shown by a green dot when you’re using Maps. The black line shows you the direction in which you have to go. Your car’s position is shown by a red dot (you can change the color in Settings). Radar View on the other hand looks a lot like a sonar. The closer you get to your vehicle, the closer the red dot moves into the center of the sonar. In order to save your position, just hit the “Save Location” button on the bottom left. Should the GPS accuracy be bellow 52 feet, Car Locator will notify you. Aside from this, Car Locator has two other good functions that allow you to save your location. The first being a fairly straight-forward one: all you have to do is give your Android phone a shake and it marks where you’re located. In order to use this function, just activate it under Settings. The second option is to remember your location with Bluetooth. 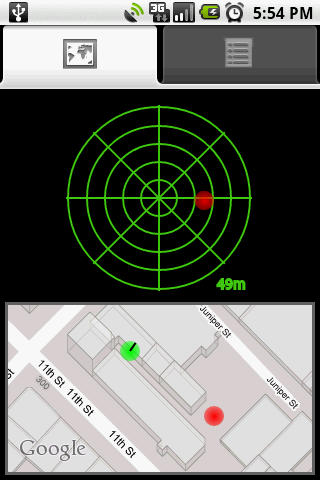 For that you need the Bluetooth Plugin for Car Locator (which you can download here) . Once this is installed, you can activate it in Settings. It works like this: once your Android is teamed up with a Bluetooth device (e.g. your car radio), Car Locator will automatically save your position once you leave your vehicle. This renders entering your position manually redundant. The Details-Tab tells you since when your car has been parked in a given location, as well as how far away your vehicle is stationed in feet or meters. Beneath this you’ll see arrows which point in the direction of your car. You can add every location to your favorites using the star button, that way you can access said positions whenever you like. Are you already familiar with the Google Maps route planner? Good! Because this can be applied in Car Locator, too. That being said, you have to search for this function as it isn’t obvious. By clicking “More” under the menu button a second menu opens up, at which point you select “Driving Directions”. You’ll immediately wind up in Google Maps’ route planner and can then allow yourself to be navigated by it. Pretty sweet! In the menu mentioned above you can also add notes or photos of locations. Furthermore, it’s also optional to determine your position yourself entering longitude and latitude details. This option is probably most appealing to the geographical pros among us. The thing that bothers me is that you can’t shut down Car Locator: you can’t switch off the app or the current search for a location. So each new search starts off as a new instance, and the previous one only comes to a close at this point. I think there’s still a little something that needs working on here. This app is certainly useful to perpetual car-seekers. What might prove to be a bit trickier is searching for your car in a multi-story garage. You can, however, include more details about the exact location of your car by inserting notes and photos of where you left it. First things first: neon green on a black background isn’t exactly easy on the eyes. Car Locator is limited to the basics, so no use in looking for fancier design elements, because they quite simply don’t exist. Operating the app is fairly easy to do, however. A few functions should be featured more prominently, e.g. displaying a given route using Google Maps—you have to go through two menus to even become aware of this function. Car Locator ran smoothly and navigated me to my two trial positions without fault. You can download Car Locator for $ 3,99 from the Android Market. 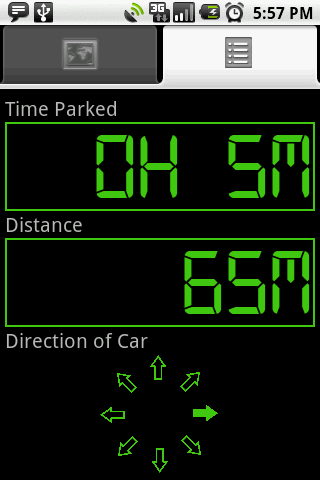 You can also find the Lite version of Car Locator – which you can only use 15 times – in the Android Market. I understand, sir, it immediately arrives at you!